Pin stub adapters for using other SEM stubs in pin type SEMs such as FEI, Philips, Tescan, Phenom, Aspex, Cambridge Instruments, Leica, etc. These can be used in Amray systems as well. For labs with multiple SEM platforms or for those who are regularly using diferent brands of SEMs, we offer the EM-Tec universal SEM stub adapter set. This universal SEM stub adapter set includes pin stub adapters, JEOL stub adapters (up to 25mm) and Hitachi stub adapters, all both ways. If you can't find the SEM stub or mount adapter you are looking for, please contact us. We might be able to offer a different solution or can manufacture custom SEM stub adapters. EM-Tec stub adapters based on standard pin stubs for FEI, Philips, Tescan, Phenom, Aspex, Cambridge Instr. 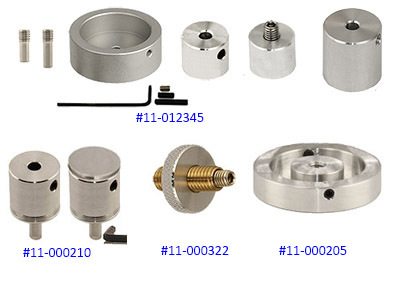 Ordering information for Pin stub adapters for using different SEM stubs in pin type SEMs such as FEI, Philips,Tescan, Phenom, Aspex, Cambridge Instruments, Leica, etc. Ordering Information for Zeiss short pin stub adapters for using different SEM stubs in Zeiss and LEO SEMs. Note: The pin stub adapters with the longer pin can be easily modified for use on Zeiss & LEO SEMs.